The global market for fluropolymers has highly competitive vendor landscape, observes Transparency Market Research (TMR). Presence of a strong and limited number of players operating in the global market is leading to intensifying competition among the players. Some of the players operating in the global fluropolymers market are 3M Company, Honeywell International Inc., Asahi Glass Co., Ltd, Daikin Industries Ltd., and Solvay SA. This competition is leading to create an entry barrier for new entrants in the market. In order to stay ahead in this competition, the key players are focusing on research and development (R&D) activities for the development and improvement of products. According to TMR, the global market for fluropolymers is expected to swell with a CAGR of 5.3% over the forecast period to 2017 to 2026 to attain the value of US$690.3 mn by the end of 2026. Based on the product type, the polytetrafluoroethylene segment dominated the market in 2016 and is expected to continue its dominance over the forecast period. Based on the application, the medical devices segment is accounting for leading share in the overall market. Based on the region, Asia Pacific excluding Japan (APEJ) dominated the overall market and is expected to remain dominant by the end of the forecast period. Fluropolymers has wide-ranging applications in medical devices owing to properties such as biocompatibility and lubricity. Fluropolymers have applications such as limb installation, gloves, jackets, aprons, and others to protect injury from numerous diseases and infection. Surgeons are also increasingly preferring fluoropolymer multilumen catheter to conduct surgeries without removing the catheter to use with another. Some of the exceptional properties of fluropolymer is making the material preferable mainly in the minimally invasive medical procedures. These factors and higher demand are boosting the growth of the global fluoropolymer market. Additionally, fluoropolymer material is available in numerous forms, but the most common is polytetrafluoroethylene (PTFE). PTFE is widely used in medical devices as it is clean and easily applicable in tissue and blood. Players in the healthcare industries are preferring the fluoropolymer for performing the process such as sterilization and high compatibility with tissues and stability in the wide range of temperatures, lubricity, purity, and inactivity in the chemical reaction and activity. 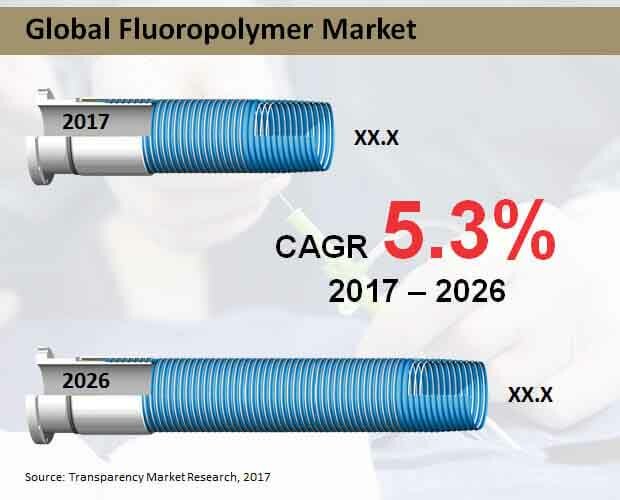 The aforementioned factors are boosting the adoption of the fluoropolymers which is likely to fuel the growth of the global fluropolymers market. Despite the growth factors, numerous regulatory bodies are increasingly imposing regulations on the manufacture of the fluropolymer products are hampering growth of the global market. In addition, growing adoption of wide range of the household and hospitals products such as stain-resistant carpets which may lead to PFOA contamination due to material and water are hampering growth of the global fluoropolymer market. Nonetheless, extensive research and development (R&D) activities for upgrading the product and its performance are offering lucrative opportunities for growth and collection of revenue. Additionally, gaining importance of piezoelectric materials in the electronics mainly in the coating in the chemical manufacturing are offering lucrative opportunities for growth.